Deroy Murdock, National Review: Why is America’s economy hogtied? For one answer, consider the excellent chart released Tuesday by the Republican staff of the Congressional Joint Economic Committee (JEC). With devastating clarity, it illustrates the miles and miles of red tape that bind the hands of entrepreneurs and CEOs like those of hijacked jet passengers. Regulation is a major and mounting cost that consumes scare resources — namely growth capital, management time, and basic patience. “If you talk to any small businessperson in America — somebody who worked hard, took a risk, risked capital, built something — the first thing they say is, ‘With all due respect, Mr. President, I built this business, you didn’t,’” Hensarling observed. Onerous regulations erupt from Washington like flaming rocks from a volcano. The National Labor Relations Board regularly coughs up such projectiles. As attorney William J. Kilberg explained in the July 12 Wall Street Journal, the NLRB last September authorized “micro” bargaining units among larger workforces within union shops. An NLRB judge, for instance, recently certified a mini-union that represents the women’s shoes departments on the third and fifth floors of Bergdorf Goodman’s New York City store. Imagine such a retail manager negotiating wages and benefits, not with his entire staff, but with various floors and even departments under his roof. Tie salesmen of Bergdorf’s unite. You have nothing but your clip-ons to lose! Representative Vicky Hartzler (R., Missouri) noted yesterday that the Occupational Safety and Health Administration approached a factory in her district and “is demanding that they paint a yellow line on their flat roof ten feet from the edge, just in case an employee goes up there, so they know where the edge of the roof is.” Every dollar spent on that paint job is a dollar that no longer can pay a summer intern or purchase a help-wanted ad. As the Competitive Enterprise Institute’s Battered Business Bureau reports, the federal government promulgated 1,283 pages of brand-new regulations via the Federal Register just last week. On July 20 alone, 25 new rules sprang to life. Between New Year’s Day 2012 and last Friday, American business people have grappled with 2,127 new regulations. Representative Hensarling yesterday recalled his conversation with the owner of a Texas cabinetry shop with 17 workers. “The guy just finally threw in the keys and shut it down,” Hensarling stated. “I asked him why, and he said, ‘You know what? It got to the point where I thought my federal government didn’t want me to succeed." Note: Deroy Murdock's excellent article drew from various press conferences and other public sources. 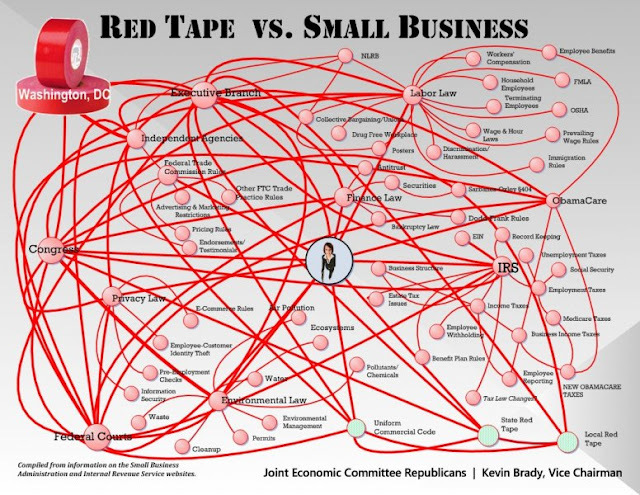 The chart was furnished by the Joint Economic Committee Republicans. Readers are encouraged to read Murdock's articles on the National Review Online. The U.S. Chamber of Commerce, referenced in the article, also ran the same article and provided the article to the ARRA News Service; however, we have linked directly to the original source. 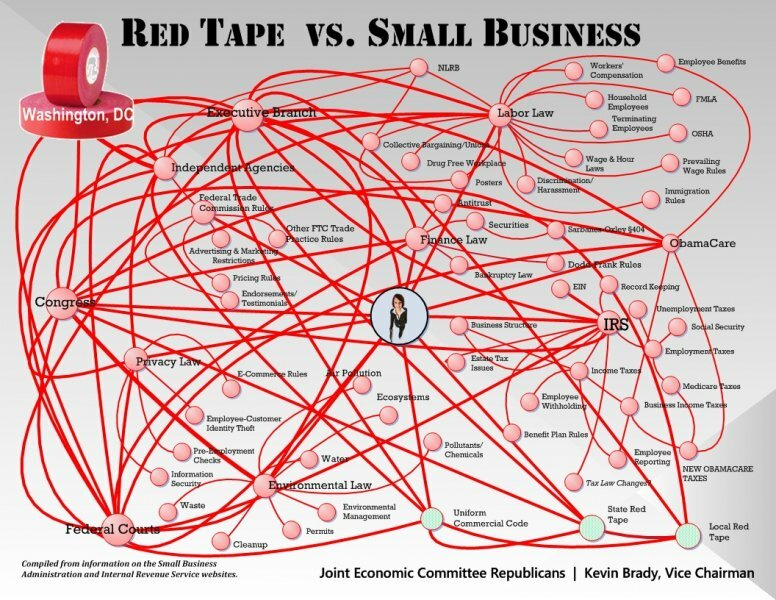 Tags: small business, government, red tape, US. Chamber of Commerce, poll, Jeb Hensarling, Vicky Hartzler, Competitive Enterprise Institute, the economy, The Corner, Deroy Murock, National Review Online To share or post to your site, click on "Post Link". Please mention / link to the ARRA News Service. Thanks!